Intel has always ensured that its high-end server platforms, one where multiple CPUs can act as a single system, have the highest core count processors. These servers go into the most expensive deployments, so they can afford the most expensive silicon to produce. The consumer market by contrast is very price sensitive by comparison, so consumers get fewer cores. However, consumers have always asked for a way of getting all of those cores, preferably in an overclockable chip, at more reasonable prices. Intel has answered your call, with the Xeon W-3175X. All 28-cores, all the time. This is our review. The Xeon W-3175X is a behemoth processor. Using Intel’s biggest x86 Skylake silicon design, it has a full 28 cores and 56 threads. These cores are rated at a 3.1 GHz base frequency, with the chip having a peak turbo frequency of 4.5 GHz. These cores are fed with six channels of DDR4-2666 memory, and are supported by 44 PCIe 3.0 lanes for add-in cards. All of this is rated at a 255W thermal design power. Normally Intel will cite a price for a processor as the ‘tray’ price, the price that they give to system integrators that buy batches of 1000 CPUs. As a result, the price at retail for customers buying off the shelf was often 5-15% higher, depending on how aggressive the retailer was compared to demand. For this product, Intel is actually providing an RCP or ‘recommended consumer price’ of $2999, rather than a tray price. Does this mean Intel doesn’t expect to sell 1000 units to any individual OEM? Either way, this is well below the $8k that OEMs were originally quoted when the product was first discussed under NDA, and below the $4k predicted prices seen at retailers in the last few weeks. 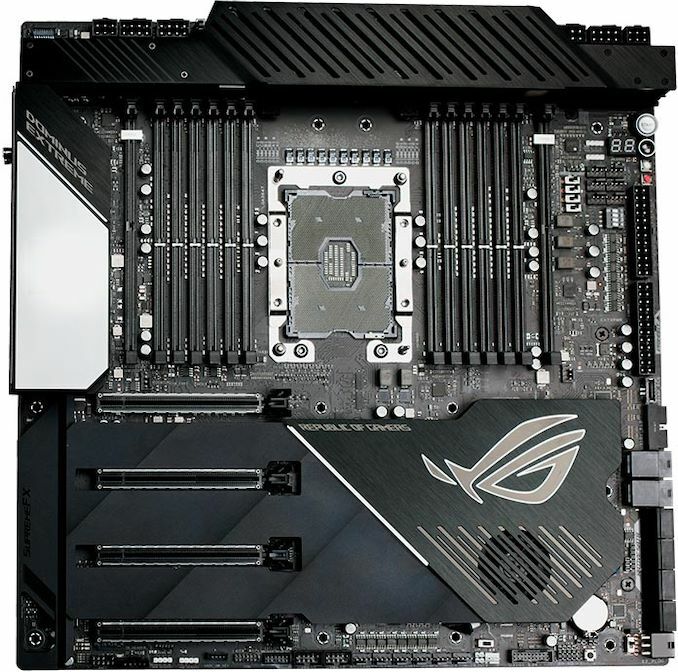 The new CPU will require an LGA3647 motherboard, of which there will only be two that will be validated: ASUS’ Dominus Extreme, and an as-yet-unnamed GIGABYTE product. As the chip is a Xeon processor, it supports both consumer grade memory and registered memory (RDIMMs) with ECC support, up to 512GB of RDIMMs. Normally a Xeon processor is a locked processor, however for this model Intel has unlocked the multiplier. This allows users to adjust the frequencies of the cores for normal code, for AVX2 code, and for AVX512 code. It is worth noting that this processor is rated at 3.1 GHz for 255W TDP, so trying to push 4.5 GHz across all cores will start to draw some serious power. This is why the ASUS motherboard has 32 phases, and we were provided with a 1600W power supply with our review sample. More on that in the following pages. There is competition for the Xeon W-3175X from both Intel’s own product stack as well as AMD. On the team blue side, the 28-core Xeon W-3175X is the bigger brother to the recently released $2000 18-core Core i9-9980XE, which has fewer cores and is lower frequency, but a much lower TDP. By comparison, Intel also has a 14-core Core i9-9990XE, which is an odd hybrid of fewer cores but a higher frequency, supposedly offering 5.0 GHz on all cores. This processor is being sold at auction to OEMs only, with no warranty, so the odds of seeing one in the wild are very slim. Intel also has its server parts to offer as competition. The analogue to the new W-3175X is the Xeon Platinum 8180, Intel’s most expensive processor to date. This processor has 28-cores, like the W-3175X, but at a lower power (205W), lower frequencies (2.5-3.8 GHz), but support for up to eight sockets, whereas the W-3175X is a single socket processor. With a tray price of $10k, the Xeon Platinum is a lot more expensive, but the markets that buy those processors very easily amortize the cost over the lifetime of the servers. Unfortunately we were not able to secure one to compare the W-3175X against, however we are trying to get one for a future review. While Intel moved from 18-core to 28-core on its consumer line, AMD released its 32-core processor for the high-end desktop market back in August 2018. The $1799 Threadripper 2990WX uses AMD’s multi-die strategy to pair together four Zeppelin silicon dies, each with eight cores, to offer a total of 32 cores, 64 threads, and four memory channels. 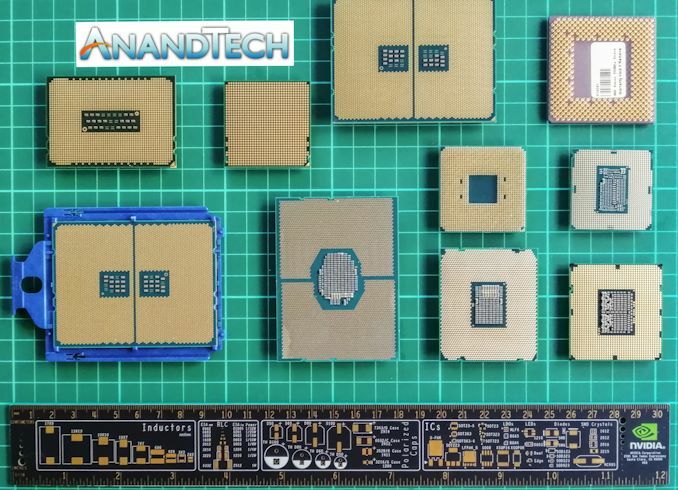 This processor has a similar 250W TDP to the 255W TDP of the W-3175X, but with slightly lower set of frequencies, at 3.0-4.2 GHz and using AMD’s Zen core which has a previous generation level of clock-for-clock performance. This processor also has 64 PCIe lanes, compared to 44. The Threadripper is some $1200 cheaper, widely available, and has over a dozen motherboards to choose from. This will be an interesting comparison. On AMD’s server side, the nearest comparison point is AMD’s EPYC 7601. 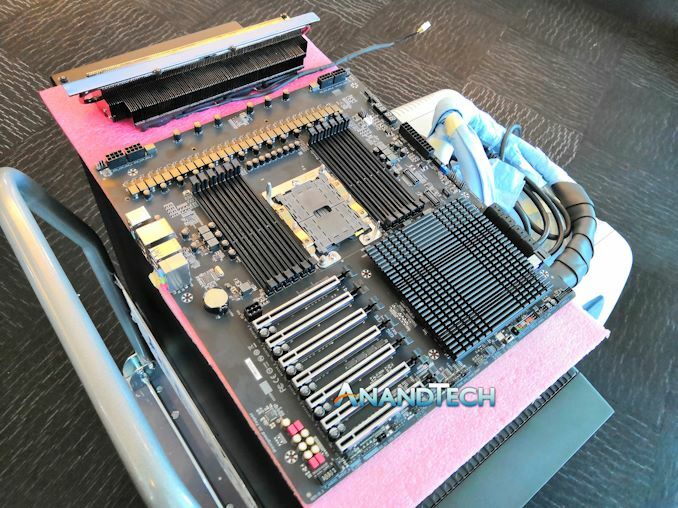 The design of this processor is similar to the Threadripper comparison point, but it offers 128 PCIe 3.0 lanes, eight memory channels, and supports 2TB of DDR4 per processor. The rated power is lower (180W) and so the frequencies are lower (2.2-3.2 GHz), but supports dual socket configurations. As a result the price of the EPYC 7601 is listed as $4200. Almost every one of the comparison points of the W-3175X has at least one functional specification where it wins, but on paper is expected to lose in performance. For this review, we’re directly comparing the new W-3175X against the Core i9-9980XE and the Threadripper 2990WX, with follow up reviews for the EPYC and Xeon Platinum. The way that Intel creates its enterprise processor portfolio has been relatively consistent for several generations – it builds three processors with different core counts to cover every server market. At present it has the Xeon Scalable ‘Low Core Count’ (LCC) design which goes up to 10 cores, a Xeon Scalable ‘High Core Count’ (HCC) design that goes up to 18 cores, and a Xeon Scalable ‘eXtreme Core Count’ (XCC) design that goes up to 28 cores. Each design can have cores disabled (though yield or product placement) to have a variety of core counts, power targets, or cache amounts. In the latest server generation, based on the Skylake-SP microarchitecture, these three chips make up Intel’s entire Xeon Scalable platform. 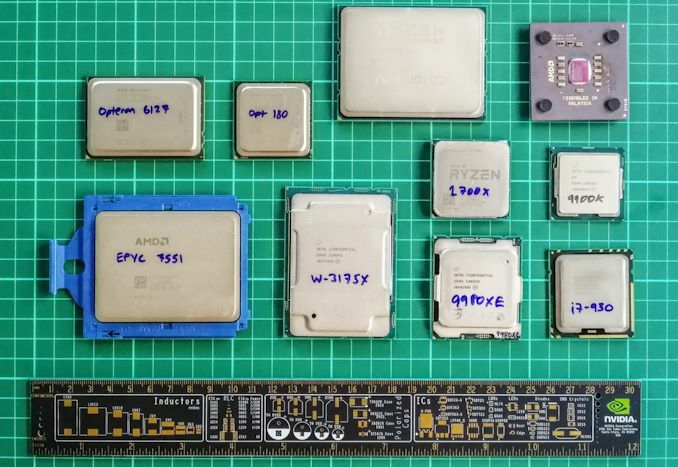 The Xeon Bronze and Silver processors are mostly LCC parts capable up to dual socket systems, Xeon Gold is mostly HCC with some cut down XCC good for 2-4 socket systems, and Xeon Platinum is mostly XCC for up to 8 socket systems. In order to supply Intel’s ‘High-End Desktop’ (HEDT) market of enthusiasts and prosumers that want a workstation but not a server, it brings these designs in. For consumer parts, Intel removes ECC support, but enables overclocking. Some of the frequencies are adjusted, and all processors are limited to single socket implementations. In the past, Intel only used to bring the LCC processor to these ‘price sensitive’ markets. For the Skylake platform, Intel brought its 18-core HCC processors down to consumers as well, helping the company to compete against AMD’s consumer offerings. Now, with the W-3175X, Intel is bringing that XCC design into the hands of enthusiasts and prosumers. For a number of generations, many enthusiasts have requested Intel’s highest core count processor in an overclockable format. When the previous generation processors were launched, one of Intel’s employees at the time polled the community on Twitter about their opinions for this part – and it was a strong ‘yes, please!’. The only downside here is that releasing a consumer high-core count processor, unlocked for maximum frequency, had the potential to eat into Intel’s Xeon server market. If you wanted the top-core count processor, without a consumer equivalent, users had to invest in the server version at a much higher cost. It would appear that Intel is now ready to make that gamble. At Computex 2018, Intel first demoed this new processor. The company used its keynote to demonstrate ‘a 28-core processor running at 5.0 GHz, coming in Q4’. This it itself is an astounding feat; however it became apparent very quickly that Intel was using additional cooling methods to make this happen. 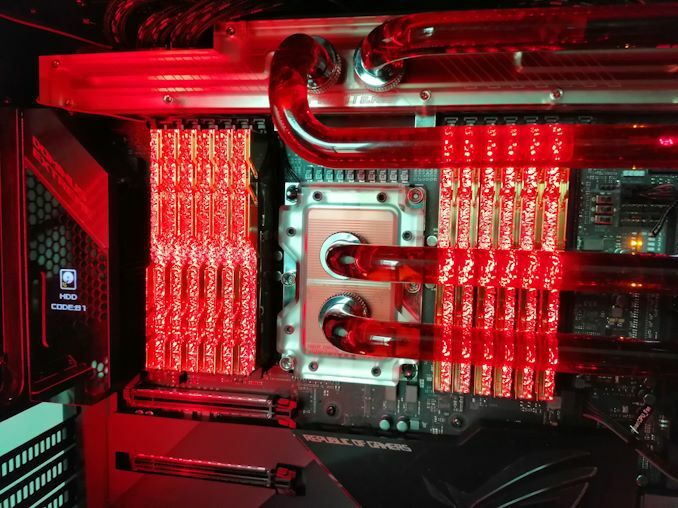 Using the GIGABYTE motherboard and a 1700W industrial grade water chiller, Intel had hidden the fact that it needed extreme measures to overclock this hard. 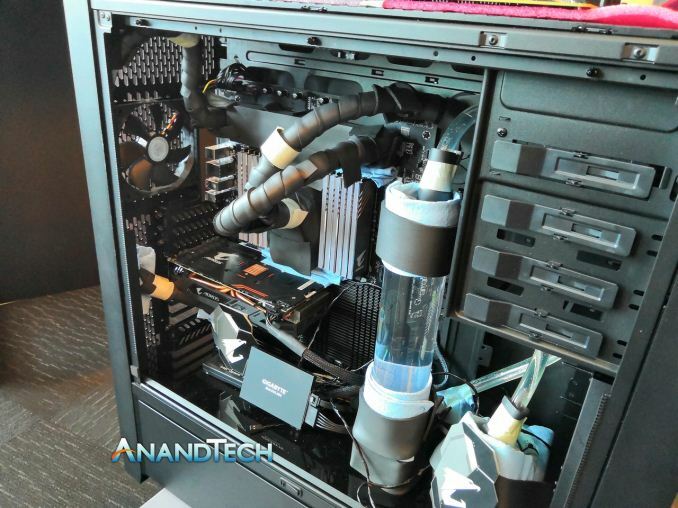 We saw the water chiller setup the next day, and Intel later clarified that they had intended to say on stage that the processor was overclocked, but the speaker on the stage forgot to as part of the presentation. We were later told by other sources that this chip was not even a Skylake-based processor, however we cannot confirm that report. Nonetheless, Intel officially announced the naming of the new processor and the specifications at its Fall PC event in October. Some details were kept under wraps, such as the price, but the ASUS motherboard was also on display and we were told to expect it at retail in Q4. Q4 came and went, without much of a peep from Intel. The company did not even acknowledge the launch in its presentations at CES. However we did see a number of system builds using the ASUS motherboard and awesome liquid cooling setups from ASUS, Phanteks, and Digital Storm at the show. It was clear that the launch was close, and within a few days of coming back from CES, one of Intel’s pre-built systems for product reviews arrived on our doorstep. We’ll be detailing that system on the next page. So when we think back to servers or workstations, almost every one of them sold in the market will have been built by an OEM or a system integrator (SI) for the customer. It is up to the OEM or SI to enable the system based on power consumption, thermal limits, and customer requirements. 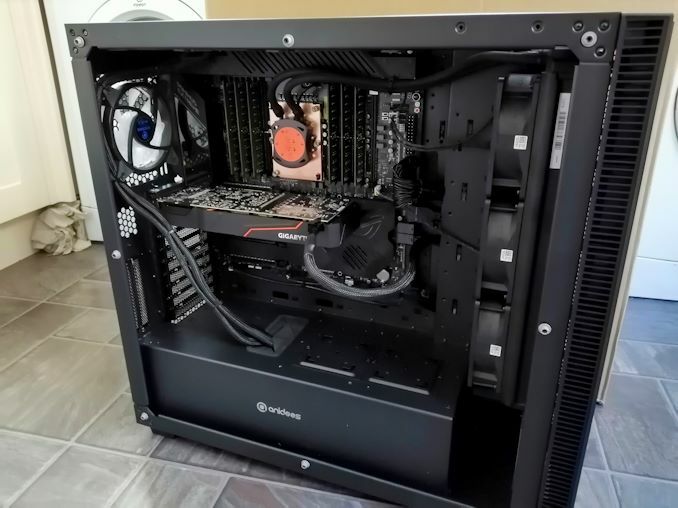 The consumer market is different, in that there is a mix of pre-built systems and do-it-yourself systems where users build their own PC after buying the components individually. Because of the extreme power nature of this processor, Intel is taking the view that it should only be sold by OEMs and SIs that have the where-with-all to deal with how to cool them and how to provide technical support. As a result, users that want this chip will have to invest in a pre-built system. Users might remember a similar processor, the 220W AMD FX-9590, was sold in this way – it wasn’t until twelve months later that we actually saw retail boxes with just the processor. By contrast, today AMD sells 250W Threadripper processors off the shelf at major retailers quite happily. In this review, we are going to take a look at the Xeon W-3175X processor in our benchmark suite. Our main comparison points are the consumer competition: Intel’s own Core i9-9980XE, and AMD’s Threadripper 2990WX (and 2950X). We will follow up with later reviews comparing the Xeon W-3175X to both AMD EPYC and Xeon Scalable. We also have some power analysis and a quick look at overclocking, with the latter likely getting a dedicated article as well. We have only had the system less than a week or so, which has limited what we can do. On the next page, I want to go over the system that Intel sent us for review. Then we’ll go into the benchmarks and data. Due to the unique way that ASUS runs its motherboards, we actually have two sets of data for the chip, one on Intel specifications, and one with Multi-Core Enhancement enabled. This is somewhat related to our TDP discussions previously, however I will cover this in the Power Analysis section of the review. I like my comments to be vivid. I didn't say he's not right. None. The point is this is a tech site. There is no need for such remarks. You have no idea what professional software costs. In the end my clients dont care if the PC costs 5000USD, 7000 USD or 12000USD. Yup. At the desktop level we have things like Adobe for $1k/seat/yr.